Introduction: Early diagnosis of leprosy is important especially to avoid disabilities. Otorhinolaryngologic evaluation helps in this diagnosis, thus the disease can be efficiently treated before facial alterations and sequel occur. Objective: To demonstrate the otorhinolaryngologic findings in untreated leprosy patients and to present the protocol of a National Reference Center for Sanitary Dermatology and Leprosy. 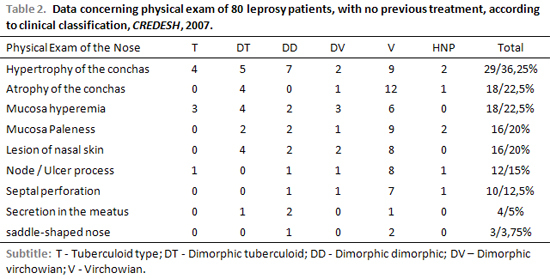 Casuistic and Methods: Otorhinolaryngologic evaluation was performed in 80 untreated leprosy patients. Data was stored in the Software of Study and Control of Leprosy of the National Reference Center and was retrospectively evaluated. Results: The commonest signs and symptoms were those related to the nose, especially nasal obstruction and turbinate hypertrophy. Lepromatous leprosy presented the highest rates of alterations; however borderline leprosy also presented a significant rate of alterations. In ear, pharynx, and larynx the symptoms were less common. Conclusions: As previously described, nasal signs and symptoms are the most frequent in leprosy patients. The importance of the otorhinolaryngologist in the multidisciplinary evaluation of these patients is reassured. Hansen's disease (or leprosy) is an infectious disease caused by bacterium Mycobacterium leprae. It regards a serious problem for public health, and Brazil has the second greatest number of cases (1). The beginning of infection occurs in the nasal mucosa (2,3). The positive baciloscopy finding in the nasal mucosa was firstly published in 1973 (4). Ever since, the superior air path has been the main way for contamination through exposure of a person with an untreated bacilliform infection (1). Thus, ENT exam is important when early diagnosing due to frequent involvement of superior air paths. It begins from the nasal fossas, then affecting mouth and larynx (1). Hence, this study aims to show the ENT findings on patients with leprosy with no previous treatment and to present the protocol of the National Reference Center for Sanitary Dermatology and Leprosy (Centro de Referência Nacional em Dermatologia Sanitária e Hanseníase - CREDESH). From January 2005 to July 2007, eighty patients diagnosed of leprosy with no previous treatment were sent to ENT Service - CREDES, according to evaluation protocol in the diagnosis. These patients were examined through clinical history, physical and complementary exams (nasofibroscopy, laryngoscopy, audiometry, etc.) when needed. A standard protocol (Picture 1) was filled up, which was comprised of ENT complaints, signs and symptoms, physical and complementary exams. Picture 1. Protocol of ENT assistance of a National Reference Center for Sanitary Dermatology and Leprosy. Regarding nose evaluation, patient answered questions about symptoms as nasal obstruction, epistaxis, crusts formation and other symptoms that either arise or become more intense after the beginning of the disease. Anterior rhinoscopy and nasofibroscopy were performed when it was necessary. Mucosa and structural alterations were described. Regarding the area of mouth-pahrynx and larynx, patient was questioned on dysphonia, pharyngeal globus. Oroscopy was performed and its alterations described. In case of laryngeal complaints, videolaryngoscopy was carried out. In the otological evaluation, patient was evaluated regarding otological complaints and otoscopy was performed. Complementary exams as audiometry and immitanciometry were performed if need. The protocol data were inserted into a Software of Leprosy Study and Control (Software de Estudo e Controle da Hanseníase (SECH) - CREDESH) and retrospectively evaluated regarding their clinical data. This investigation was approved by the Research Ethics Committee under # 025/2000. From the 80 evaluated patients, 31 were female (38.75%) and 49 were male (61.25%). Regarding clinical forms of the disease, they were tuberculoid type (T) in 4 patients (5%); dimorphic tuberculoid (DT) in 23 ones (28.75%); dimorphic dimorphic (DD) in 10 patients (12.5%); dimorphic virchowian (DV) in 14 patients (17.5%); virchowian (V) in 26 of them (32.5%) and 3 patients (3.75%) presented pure neural hansenosis (PNH). The most frequent complaints and alterations were associated to nose (Table 1), being obstruction (36.25%) and crusts formation (30%) the main ones. The most present signs were hypertrophy of the conchas (36.25%) and mucosa hyperemia (22.5%). 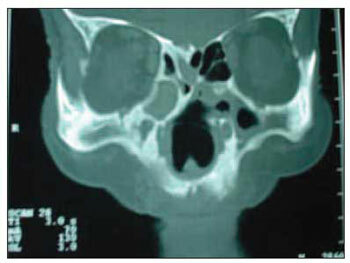 Septum perforation and saddle-shaped nose were found in 16.25% of the cases (Table 2). Regarding clinical form, the virchowian one was responsible for 64% among complaints (Picture 2). The dimorphic form accounted for 30%. At the nasal physical exam, virchowian represented 49% of the alterations and dimorphic forms were 39%. Picture 2. Computed Tomography Image of the sinus of the face in coronal cut showing atrophic rhinitis, oedema of nasal mucosa and septum perforation, findings of virchowian leprosy. The major alterations in the mouth-pharynx and larynx area were pharyngeal globus accounting for 7.5% and neck pain for 5%. At oroscopy exam, it was found alterations as vegetation, development of ulcers or nodes in 4 patients (3.75%). Otologic alterations such as ear pain (8.75%), hypoacusis (8.75%), tinnitus (6.25%) and vertigo (3.75%) were the least common found. Leprosy can be early diagnosed by ENT exam, once under suspicious of dermal lesion the association with nasal alterations becomes diagnosis highly suspicious (1). As previously mentioned, the nose was the most affected area in patients with leprosy, regarding the head & neck structure. Physical manipulation on the nose and the evaluation of alterations are easy to be performed and also enable early treatment by preventing deformities, as the nose represents unquestionable importance for social acceptance of the individual (7). The septum, conchas and anterior nasal spine are the most involved nasal structures, for presenting mucous coating in their two faces (7). Nose manifestations can be early, intermediate and late ones. In the first type, there is infiltration of mucosa and abnormal drying. In the intermediate manifestation, infiltration grows causing nasal obstruction with an increase on nasal secretion then raising crusts. And in the late manifestation, there is development of an ulcer, secondary infection, reduction of the blood irrigation of the perichondrium, what can cause perforation of the cartilaginous nasal septum, alteration on sensitiveness and changes on the sense of smell. Nose can become saddle-shaped if nasal septum is destroyed, (1). In this study, the major complaints were nasal obstruction (36.25%), crusts formation (30%) and recurrent epistaxis (15%), but bleeding was rare (6). These alterations besides being intermediate, they help on early diagnosing. In another study, more than 90% of patients with virchowian leprosy reported nose symptoms when questioned (8). In this study, eleven patients complained of anosmia/hyposmia (lack/reduced ability to smell). Therefore, Barton (1974b) reports that patients do not mention such symptom (9). Ten patients presented perforation of nasal septum, and three of those developed to saddle-shaped nose. Such deformity could have been avoided if early diagnosis and treatment. Farina (1991) when described surgical reparations of saddle-shaped nose from different origins showed that the highest percentage of complications is related to leprosy patients (10). Eighteen patients presented atrophy of nasal concha, and in sixteen of them with expressive paleness of the mucosa. Barton (1973) reports that around half of patients with atrophic rhinitis might present some loss of nose sensitiveness (11). Oral cavity and the larynx are also structures affected by leprosy, being part of the ENT exam. Though, oropharynx lesions are secondary to nasal ones and are present only in long-term development patients (1). In the history of the disease, larynx lesions are severe; they can be either fibrotic with immobilization of vocal folds and dysphonia, or ulcer types, which are even more severe leading to pain, dysphonia and dyspnea (1). These lesions have not been observed under early polichemotherapy. In this study, the following mouth-pharynx and larynx alterations were fond: pain in oral cavity (5%), pharyngeal globus (7.5%) and hyperemia in oral cavity (1.5%), though videolaryngoscopy was not performed. Barton (1974c) examined 34 patients, and did not observe any involvement on vocal folds, but there was involvement of the epiglottis in two ones (12). Regarding the ear, leprosy seems to affect only its external part (1). Only one patients presented oedema of the external hearing duct; seven of them reported hypoacusis and other complaints previously present but with no relation to leprosy. Barton (1989), in the otological evaluation of leprosy patients, also found patients with expressive hearing loss and other symptoms (6). It is also reported that clinical signs and symptoms and alterations on physical exam were found in the dimorphic group, by suggesting an early involvement of the nose in the process of leprosy and its importance on diagnosis and contamination of the disease. Therefore, this study shows the ENT findings of patients with leprosy and reinforces the importance of early diagnosis in order to prevent definite complications. This study showed the protocol used in the evaluation of leprosy patients, with no previous treatment in the ENT Service of CREDESH. It reported, as in the literature, that nasal signs and symptoms are the most frequent ones, such as nasal obstruction (36.25%), crust formation (30%) and recurrent epistaxis (15%). It also reassure the importance of an otorhinolaryngology professional in the multidisciplinary evaluation of patients. Authors thank the team from CREDESH and FAPEMIG, CNPq, CAPES, FINEP and also the Health Department for the financial support. 1. Talhari S, Neves RG. Hanseníase. 3ª. ed. Manaus: Tropical; 1997. 2. McDougall AC, Rees RJ, Weddel AG, Kanan MW. The histopathology of lepromatous leprosy in the nose. J Pathol 1975; 115:215-26. 3. Job CK. Nasal mucosa and abraded skin are the two routes of entry of Mycobacterium leprae. Star 1990; 49:1. 4. Pedley JC. The nasal mucus in leprosy. 10th International Leprosy Congress Paper 1973; 6:45. 5. International Leprosy Association Technical Forum. 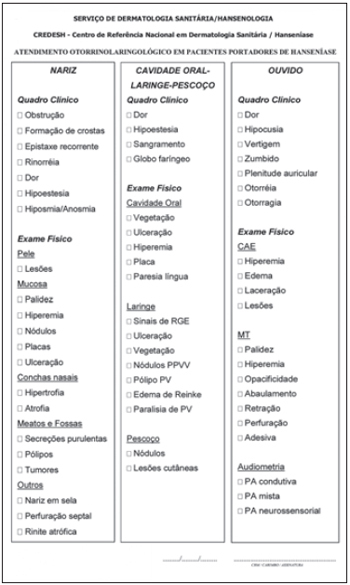 The diagnosis and classification of leprosy. Int J Lepr Other Mycobact Dis 2002; 1:S23-S31. 6. Barton RPE. Ear, nose and throat involvement en leprosy. Leprosy, Medicine in the Tropics 1989; 243-52. 7. Duerksen F, Virmond M. Nariz; Cirurgia reparadora e reabilitação em hanseníase. Bauru: ALM Internacional. Centro de Estudos Dr. Reinaldo Quagliato, Instituto Lauro de Souza Lima; 1997. 8. Barton RPE. A clinical study of the nose in lepromatous leprosy. Lepr Rev 1974a; 45:135-44. 9. Barton RPE. Olfaction in leprosy. J Laryngol Otol 1974b; 80:355-61. 10. Farina R, Farina G, Cury E. Os enxertos ósseos na correção das deformidades do dorso osteocartilaginoso do nariz. Folha Méd 1991; 103(1):27-36. 11. Barton RPE. The management of leprous rhinitis. Lepr Rev 1973; 44:186-91. 12. Barton RPE. Lesions of the mouth, pharynx and larynx in lepromatous leprosy. Lepr India 1974c; 46:130-34. 1. Doctor. Resident Doctor in the ENT Service of the Faculdade de Medicina da Universidade Federal de Uberlândia. 2. Otorhinolaryngologist. Head of the Division of Cranio-Maxillo-Facial Surgery of the ENT Service of the Faculdade de Medicina da Universidade Federal de Uberlândia. 3. Professor. Head of ENT Service of the Faculdade de Medicina da Universidade Federal de Uberlândia. 4. PhD Professor. Head of Leprosy Service of the Department of Medical Clinic of the Faculdade de Medicina da Universidade Federal de Uberlândia. National Reference Center for Sanitary Dermatology and Leprosy, Clinical Hospital, Medical School, Federal Universtity of Uberlândia, Uberlândia, Minas Gerais, Brazil. FAPEMIG, CNPq, CAPES, FINEP e Ministério da Saúde. This article was submitted to SGP ( Publication Management System) of R@IO on January 4th, 2008 and approved on January 16th, 2008 at 11:57:58.